Vintage From Paul is delighted to offer these lovely Barker Brothers England 1930 Hand Painted Restaurant Grille Plates. 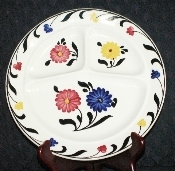 The restaurant ware grille plates have a solid white vitrified china body decorated with vivid blue, red and yellow hand painted flowers, both at the rim and on the center of the body. The plates are divided into three distinct sections of a "grille" plate. Each of the available Barker Bros England 1930 Hand Painted Restaurant Grille Plates is in superb condition with no chips, cracks, and few, if any utensil marks. The graphics are crisp, the colors vibrant. The Barker Bros England 1930 Hand Painted Restaurant Grille Plates have an incised diamond mark and in green a fleur de lius surrounded by "Barker Bros Ltd. England" This mark dates these plates to the period of 1930 to 1937. The Barker Bros England 1930 Hand Painted Restaurant Grille Plates measure 10-1/4 inches in diameter. Manufacturer of earthenware and bone china at the Meir Works, Barker St, Longton. Barker Bros was founded in 1876 and incorporated as Barker Bros Ltd in 1882. The business was acquired in 1910 by brothers William, Joseph and Arthur Hewitt and from 1928 to 1945 was owned and managed by William E. Hewitt. Sampson Smith Ltd was acquired in 1939 and from 1941 to 1945 production of the two firms was concentrated at the Barker Bros factory. Barker Bros Ltd was taken over by Alfred Clough Ltd in 1959, but production under the Barker Bros name continued until the business closed in 1981 following the dispersal of the assets of Grindley of Stoke (Ceramics) Ltd (a successor company to Alfred Clough Ltd).